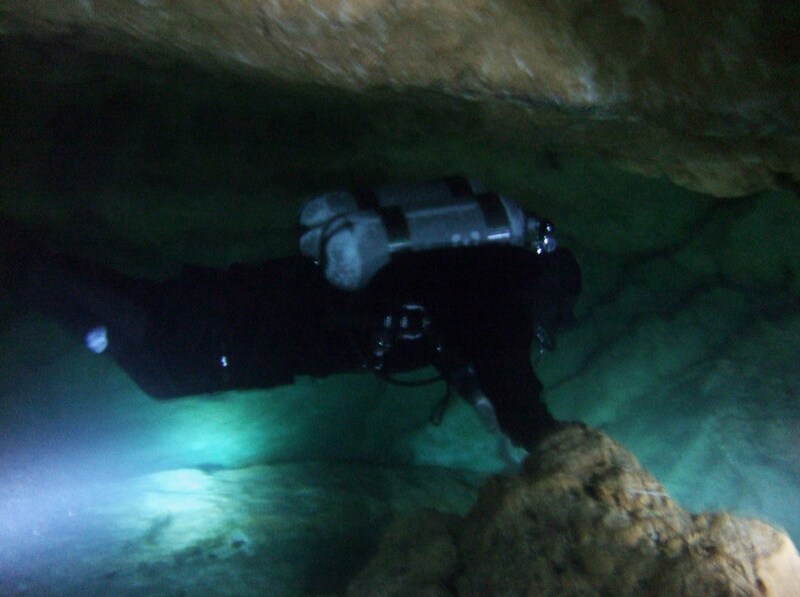 Cave Diving is seen by many as the ultimate challenge. Not because it is deep, dark and dangerous (it isn’t) but because the confines of the environment are the ultimate test for your diving technique and skills. Don’t get me wrong, I’m not talking about small spaces but even a large passageway with plenty of space for divers to swim through has a floor, walls and a ceiling. Often these have easily disturbed sediment that could lead to a rapid loss of visibility if you make a wrong move. Now, imagine completing a simple Out of Air Drill in an area where your body position must remain perfectly horizontal and your position in the water column can’t change either. You might not be able to move up or down very far without impacting on the ceiling or floor and your fins need to remain motionless. You also need to manage your (very bright) light so that your buddy can see your signals and you don’t dazzle them. If that sounds exciting to you then you know how I feel. 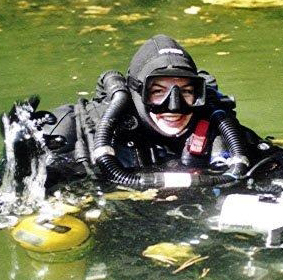 I have been cave diving since 1998 and have worked my way up the overhead instructor ladder teaching Wreck Diver, Cavern Diver and Introductory Cave Diver Courses for many years. I have assisted on several cave diver courses over the last five years but this year it was time to complete the full cave diver Instructor course. Arriving in Florida I met up with Martin who had already been there for a month teaching CCR Cave, OC Cave and Advanced Cave Courses. After a day of warm up dives it was straight in at the sharp end. My task was to teach a lights out exit drill (under Martin’s supervision). Martin Robson is a Cave Instructor Trainer Trainer so he must have developed some kind of super powers but for me the challenge of looking after and evaluating 3 students when I couldn’t see them seemed impossible at first. On my first attempt my eyes felt like they were popping out of my head even though it was pitch dark and opening them wider wasn’t helping! Despite this, Martin seemed to be able to see everything. He shared the Secrets of the Guild with me and I soon found myself using all my senses to control the exercise, read the cave and monitor my students whilst swimming backwards! As the days went by and the students developed further it didn’t get easier but harder. Helping divers understand how to improve their dive technique is the biggest challenge. 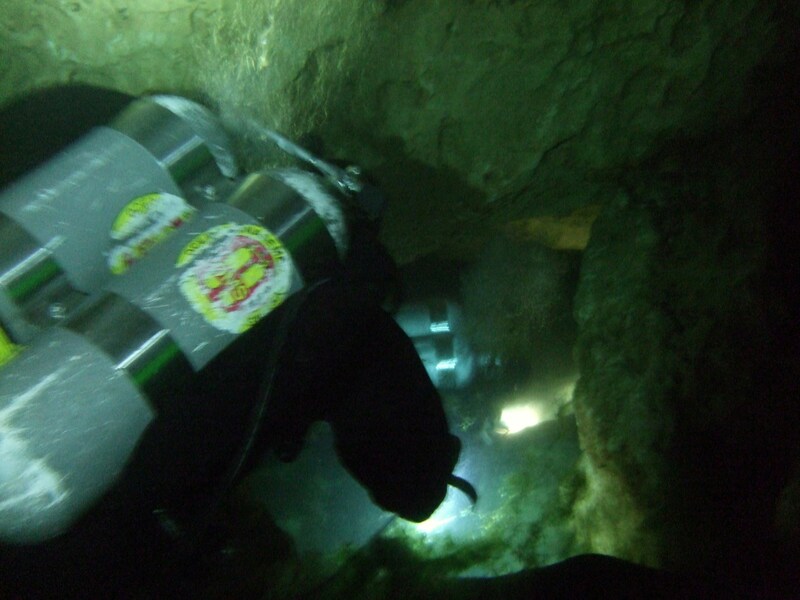 As always excellent buoyancy control is the biggest asset a diver can have in a cave and even very accomplished divers can find that in this environment a greater degree of control is required. Knowledge of the environment is also essential. 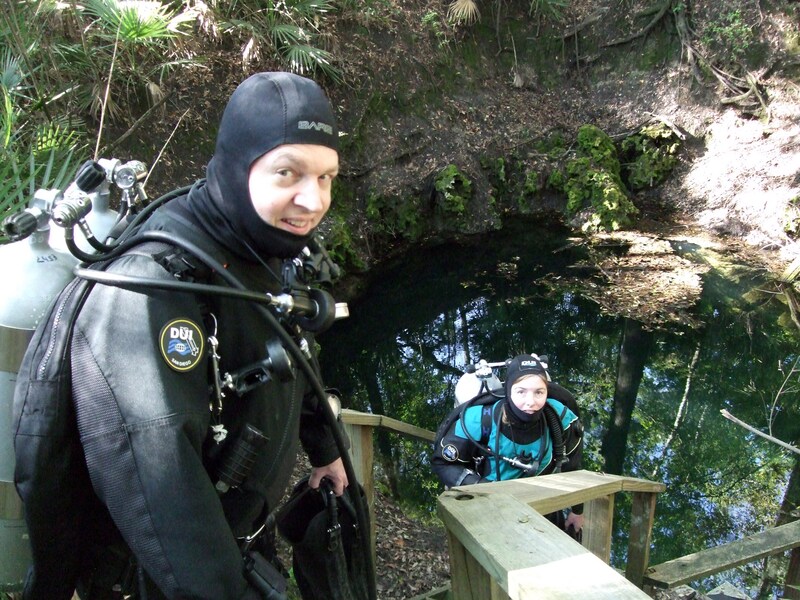 Although I have dived in Florida caves many times I had to become much better acquainted with the caves. It is essential that skills are conducted in areas where damage to the environment is avoided and visibility is not reduced as this could affect the safety of other dive teams in the cave as well as our own. On top of this each training exercise must be done in a place where it can be as realistic as possible to maximise learning. At first I frequently found myself on the wrong side of the dive team in an area of the cave where it was difficult to pass the group. Martin’s briefings, subtle reminders and signals helped me to anticipate where I needed to be in relation to the team and the best time and place to move. At the end of a fortnight and 32 dives later I finally graduated on my birthday! Definitely something to celebrate. Thanks to Martin for his patience and coaching and to the students for helping to make it so much fun. Excellent post Vikki, thank you for sharing and congratulations to you! Nice write Vikki! Getting jealous here . . .